A touch of class, a hint of civilization, a love story, and a tragedy are themes entwined in the tale of the McCormick Rose, a cutting of which graces the steps into Old Main at NAU. The first McCormick Rose was brought as a cutting by Margaret Hunt McCormick, the bride of Richard McCormick, Arizona’s Second Territorial Governor, to Prescott in November 1865. A French Boursaid (Rosa gallica), an ancient French hybrid, this pink rose was the first cultivated rose in Arizona. The rose at Old Main was a cutting of the McCormick Rose at the Sharlot Hall Museum in Prescott which was in turn a cutting from the original rose planted by Margaret McCormick by the front door of the Governor’s Mansion in Prescott. The McCormick Rose began its journey in Margaret McCormick’s trousseau as she and Richard made their way to Arizona. First, the cutting accompanied them by steamship from New York to Jamaica and thence to Aspinwall at the Isthmus of Panama. Next, the cutting went with them overland on mule back to the Pacific Coast where they and the cutting again boarded a steamship for Acapulco. Richard and Margaret spent two days touring the deserted city, the French Army having chased out the Mexicans. Finally, the cutting went with them to Los Angeles. After a few days rest in Los Angeles, they and the cutting took a stagecoach to Yuma where they boarded a steamer for a trip up the Colorado River to Ehrenburg. 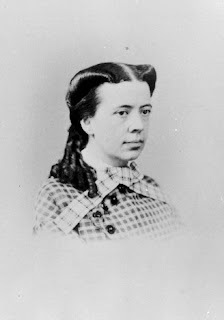 Then as Margaret described the last leg of the journey, it was “two ambulances, six government wagons, and two private baggage wagons” crossing the Mohave Desert to Prescott. The McCormick Rose, a hearty cultivar, flourishes today at Old Main and Cline Library. Prescott had barely become Prescott at the time. Before that it was a single hastily built, ramshackle log cabin on the banks of Granite Creek, called Fort Misery by John Goodwin, the First Territorial Governor. The Governor’s Mansion to which Richard McCormick brought his well bred, well educated, New Jersey bride was a log cabin with dirt floors and windows without glass. Happily, Margaret was given carte blanche on improvements, furnishings, and decorations, having furniture made from pine logs. A considerable horsewoman, Margaret accompanied Richard on many of his trips throughout the Territory, becoming acquainted with many of the pioneers, impressing them with her grace. Prescott at the time was a jumping off place for what Richard McCormick called a “terra incognita”, an unknown and unmapped land, a land fit for only “daring trappers and adventuresome gold seekers.” The log cabin Governor’s Mansion was a mansion only in comparison to the tents, shacks, lean tos, and wagons making up the rest of the settlement. On her return from a trip with Richard to San Francisco, she gave birth to a stillborn child. Thought to have been recovering well, she suddenly lapsed into a violent sickness and died one day short of her 24th birthday. She was buried with her stillborn child in her arms under an oak tree near the mansion, her grave strewn with wildflowers. Cuttings of the McCormick Rose, a poignant touch of Arizona's pioneer history, are available at the NAU Research Greenhouses (523-9100 or 523-9103).